So just what is Texas BBQ? 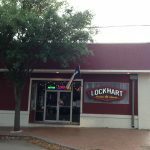 We paid a visit to a Lockhart Smoke house near Dallas to watch them do it right… It’s the home of Jalapeno Sausage (via Kreuz Market). 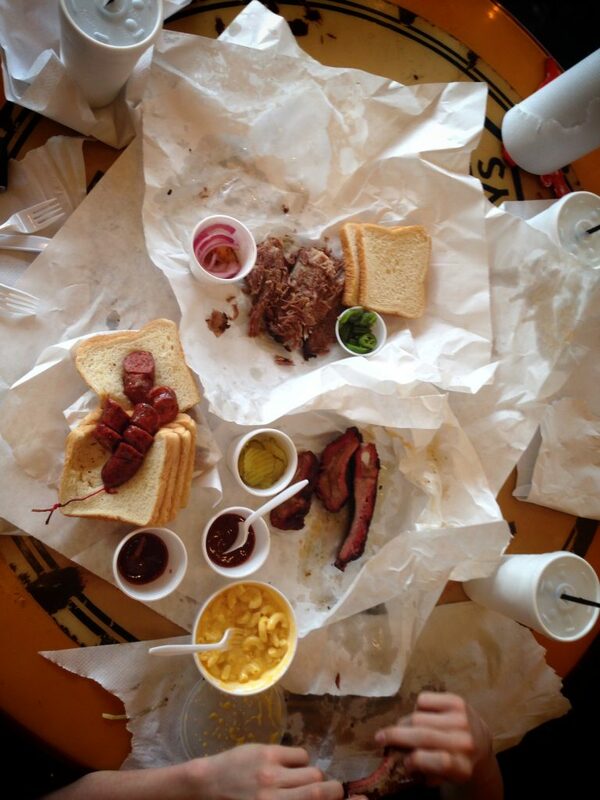 It’s beef it’s brisket-it’s butcher paper it’s jalapeno peppers… Texas BBQ just what makes it special? 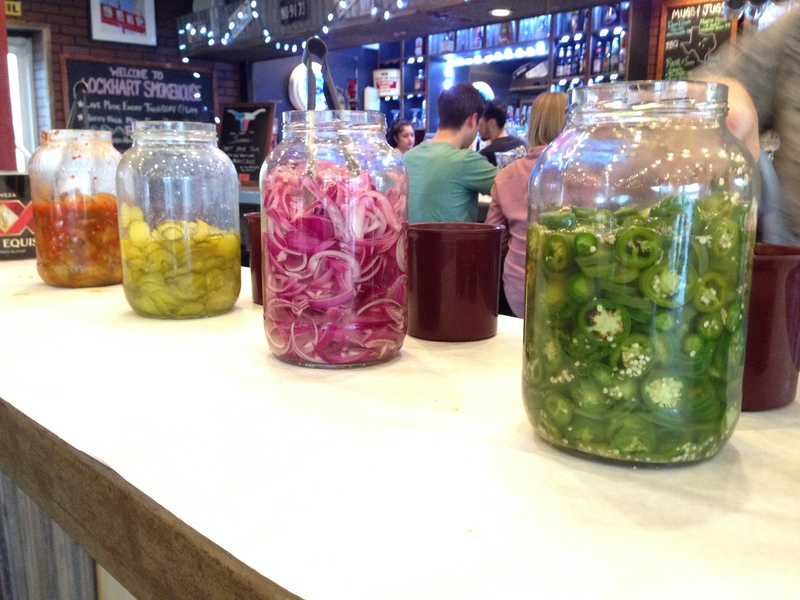 Plus a trick to the sauce… Just outside of Dallas at Lockhart BBQ and yes… my test its you CAN smell smoke! Texas BBQ is also aligned with fresh smoked sausage- here the juicy snap of a fresh smoked jalapeno sausage is a specialty – and here they tip their Texas hats to the best -Lockhart smoke house is the area’s exclusive purveyors of Kreutz Market sausage- Kreuz is Texas BBQ royalty since 1900..
-here they show off the connection to Kreuz on the walls and on the trays with that incredible Jalapeno sausage. How many times you been here? : “Too many times to count… I have been in and out of this state up and down the country and have not found better BBQ. 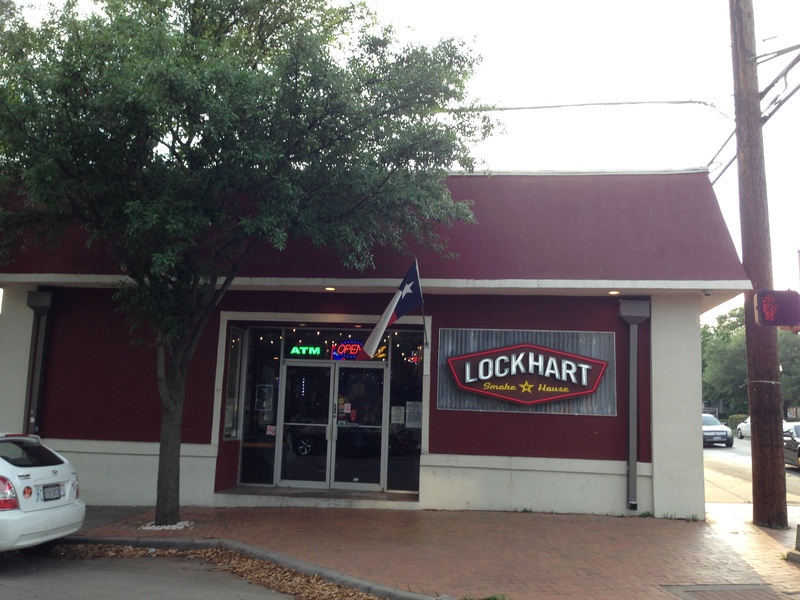 They Do allow sauce at Lockhart – and unlike Kreuz they DO allow sauce and forks. The sauce in Texas is tangy and dark red with ketchup and Worcestershire and sometimes served hot like this – at Eddie Deen’s Crossroad’s BBQ near Cowboys stadium…. A real treat -This is one of the few places you can actually get the sauce hot right out of the cooker. In fact the bbq trick is to serve the sauce hot on the side – it adds a definite zip of freshness that sends tongues into overdrive. See our whatsthishere sauce recipe video for a close impostor. 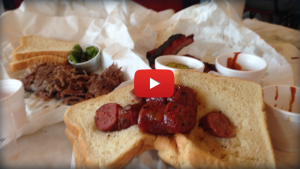 For more on BBQ from Memphis watch here.